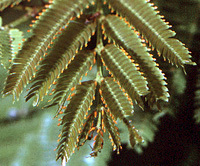 Mimusoid legumes (subfamily Mimusoideae): Acacia cornigera is another species of Acacia that hosts ants in hollow thorns. The photo shows a few ants on the leaves. The orange bodies on the leaflet tips are packets of carbohydrates the ants collect and eat. The knobs on the leaf axis secrete a sugary liquid that the ants drink. This species was photographed in coastal Guerrero, Mexico.